Rathbone Precision Metals can engineer a custom process to effectively flow material into the profile configuration required by the customer. Rathbone Precision Metals forms metal by pulling it through a die, a process that increases mechanical properties via cold working as the metal conforms to the shape cut into the die. Additional benefits the Palmer, Massachusetts firm points to in its cold drawing process are the near-net shapes created without wasting material, and a smoother surface finish. As the material is pulled through a die, the bar elongates as it conforms to the shape of the die along the entire length of the bar without leaving a pile of chips on the floor. Cold drawing increases mechanical properties because as it pulls the metal through a die, the metal’s cross-sectional area is reduced as it flows to fill the shape cut into the die. A 12-foot bar pulled through a die might come out 24 feet long. Depending on the number of pulls through a set of dies that are required to produce the finished shape, the bar can elongate even more than 24 feet. As it conforms to the shape of the die, the metal is cold worked, its crystalline structure is distorted, and mechanical properties are increased. That’s important for applications that require high strength, such as gears and handgun triggers. Both near-net shaped cold drawn gears and trigger profiles can then be finished with less machining and waste. The older Eberly is the inventor of the steel alloy 430 FR stainless, and glass ceiling 27 steel. In addition to growing up at his father’s side, Glenn worked in the metals business since 1979. Eberly said a net shape profile may be cut to length. 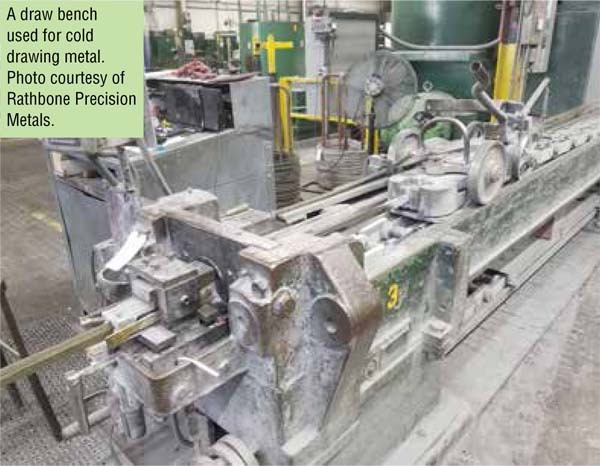 That means if the die formed the bar into a profile 12 feet long, Rathbone uses its adiabatic shear to fulfill high-volume requirements for cut-to-length pieces. Rather than using a saw that creates waste (kerf loss), Rathbone uses an adiabatic shear, which creates no kerf loss. Each resultant sheared piece can then be finish-shaped by a secondary process. Some products need secondary processes, some don’t. If a customer is CNC machining a part now, what are the advantages of cold drawing? “Consistent dimensions down the length of the bar that they’re now machining or doing secondaries on,” Eberly said. 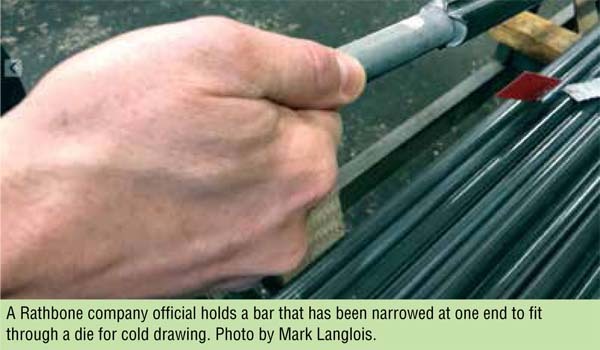 Cold drawing creates little or no waste and it can create near-net or net-shaped parts. The parts are also smoother than the typical finish of a machined part. Typically, Rathbone products reach a surface finish of 125 on the RA smoothness scale. In some cases, they can achieve an RA of 40, which is very smooth. “They’re going to produce more scrap by machining a piece from a round bar than they would from a profile,” Eberly said. The bar pulled through the die is re-shaped into a profile, which is the shape the customer ordered. The profile is the view of one end of the bar. It could be star shaped like a gear, or any other shape that can be drawn through a die. A completed profile may be pulled through smaller and smaller dies numerous times until the profile is the shape the customer wants. In that case, the original 12-foot bar might be dozens or hundreds of feet long by the end. Rathbone handles some orders that reached thousands of feet per profile. 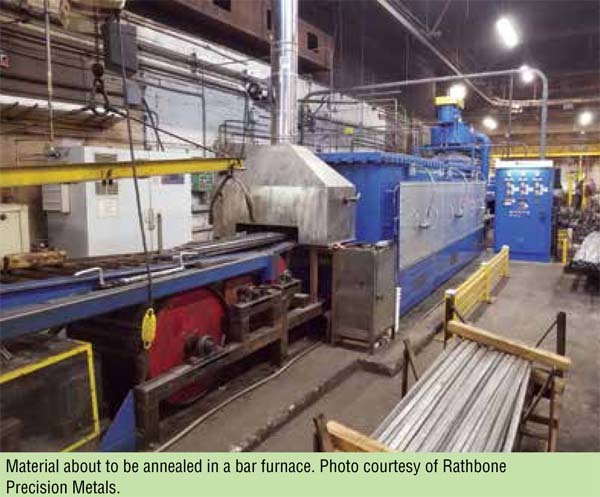 Rathbone Precision Metals (www.rathboneprofiles.com) has been practicing for more than 100 years—since 1905, when Andrew Rathbone founded the firm in Palmer. The company created parts for both World War I and World War II. Much of its work grew from the firearms industry that grew up along the Connecticut River. While its first parts were mostly red metals, today, Rathbone creates parts in carbon steels, alloy steels, and stainless steels. The company’s clients represent numerous market segments, including mechanics, power generation, firearms, medical, machine tools, linear motion, defense, paper and pulp, automotive, valves, and fittings. For the medical industry, Rathbone produces profiles for instruments and for in-body bone plate. For linear motion applications, the company manufactures linear guide profiles. It makes profiles used in the firearms industry for barrels, hammers, gas blocks, gas keys, receiver rails, plunger tubes, and gun sights. “The firearms industry isn’t as strong as it used to be,” Eberly said. Rathbone also manufactures missile and machine gun component profiles for the defense industry. For general mechanics, the company makes sprag profiles for one-way clutches, gear and spline profiles, solenoid plunger profiles, and profiles for non-rotating shafts for pneumatic actuators. Rathbone’s cold drawing is done at room temperature, and because of that, the metal pulled through the die changes its crystalline structure, creating dislocations, and emerges harder. Depending on the amount of cold work achieved as a result of cold drawing, it might require an anneal (a heat treat) to soften it so that it can be drawn two or more times. A typical profile might take two draws, or it might take eight, with anneals in between, to achieve the finished shape. In addition to cold drawing, Rathbone’s second main process is cold rolling. In this process, a thin profile is pressed repeatedly between rollers. As the metal moves between the rollers, it becomes thinner and wider. This process is somewhat less precise than cold drawing, but it may be exactly what the customer wants. A customer will ask Rathbone for specific properties in the finished metal. Part of Rathbone’s expertise is knowing how to impart those properties into the metal. A customer might require a specific tensile strength or a specific yield strength, or a specific smoothness. “We’re an engineering company. We engineer our processes to meet the customer’s requirements on that profile,” Eberly said. “Rathbone’s greatest strength is our capability to produce precision asymmetrical profiles to tight linear dimensional tolerances with excellent surface finish in a wide range of materials, ranging from low carbon and high carbon steels, alloy steels, and stainless steels. 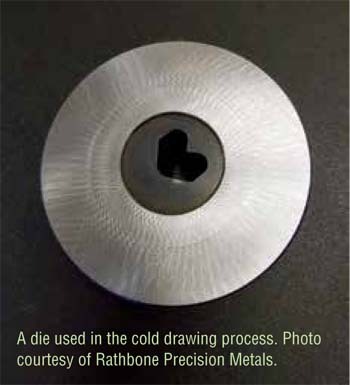 Knowing how different metals react to the cold drawing process is Rathbone’s expertise. That expertise includes guidance to assist the customer’s raw material selection, the proper lubrication required to draw steel through a die, and proper die design to create the desired shape. In typical cold drawing, workers first point one end of the metal bar until it is narrow enough to feed through the die. The die, the bar, and a hydraulic system to draw the metal are all part of the draw bench. One important item on the bench is the carriage, which pulls the metal through the die as it rolls along rails on the bench. A common approach to narrowing the tip of the bar is to heat it and create the taper using “forge pointing.” A second method Rathbone uses is turn pointing, or machine pointing, which is grinding the point into the bar. Yet another option for complex shapes is “burn pointing,” which uses acid to erode metal into the narrow tip. Once the bar tip is through the die, the gripper attached to the steel carriage grabs the bar. On the draw bench, the raw bar is ready for drawing when the point is placed through the die. The carriage gripper grabs hold of the tip on the other side of the die. Hydraulic pressure rolls the carriage down the rails, away from the die, as it pulls the bar through the die. The carriage holds the metal point and pulls the bar through the die. As the carriage rolls away from the die, the bar takes on the shape cut into the die and elongates. The process, called cold drawing, also compacts the metal’s crystalline structure, making the metal stronger. That process can be continually repeated through smaller and smaller dies to reach the final shape. Because the metal gets stronger with each pass, in many instances, it must be heat treated to soften it up before the next cold draw. The heat treatment, called annealing, makes the metal softer, more ductile, and more workable. A metal that is being cold drawn may be annealed many times during the drawing process. What’s Your Strategy for Meeting IMDS Requirements?